It's on! Help Mercy win the 2019 #RivalsUnite4Girls challenge! Click here to donate or Venmo us: @Mercy-Academy. Please be sure to include your full name and graduation year in the memo. Last year's #RivalsUnite4Girls Challenge raised nearly $243,000 in support of Catholic education for girls. Close to 3,500 Rockets, Jaguars, Toppers and Valkyries gave to their alma mater during this joint alumnae fundraising challenge advancing each school's annual fund. We need your help! 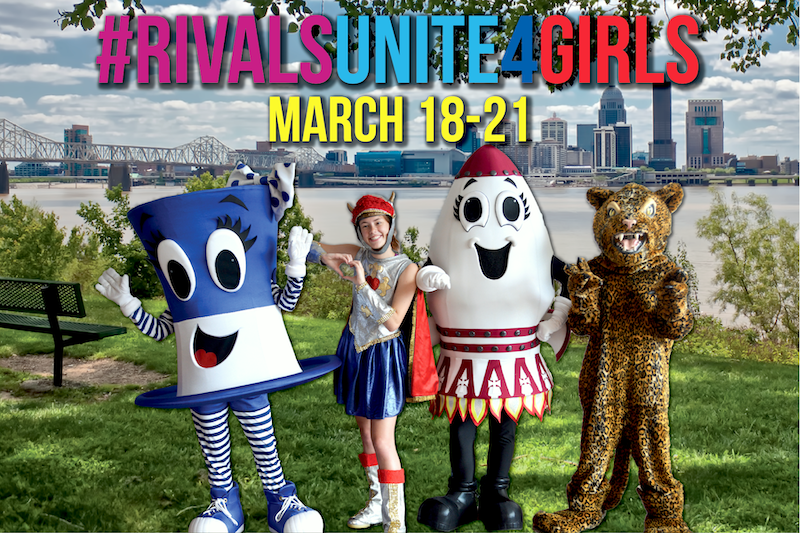 The fourth annual Rivals Unite 4 Girls Challenge begins Monday, March 18 and ends Thursday, March 21. Your donation is a great way to show your Mercy pride. No gift is too small. The Rivals Unite 4 Girls Challenge is measured by the number of alumnae who give, not the dollar amount raised. Last year, we received amazing support with 17.12% of our alumnae giving to Mercy, falling short of winning the golden pig by just 0.51% (that's only 28 donors)! Let's bring the golden pig back home to Mercy this year, Jaguars and Missiles! Your donation goes directly to our tuition assistance program, which aids over 30% of our student body. Your gift truly makes a difference. "Many years ago, Mercy introduced me to a way of life where women became empowered to get things done within a faith community of service. It demonstrated to me that women carry influence and live in peace and harmony when they sacrifice and work together. Education today must prepare women to cope with a rapidly changing environment. Very little good can be accomplished without the use of money. Contributions to your Alma Mater pay it forward for future generations.It's a whole hearted win, win, win, win opportunity."